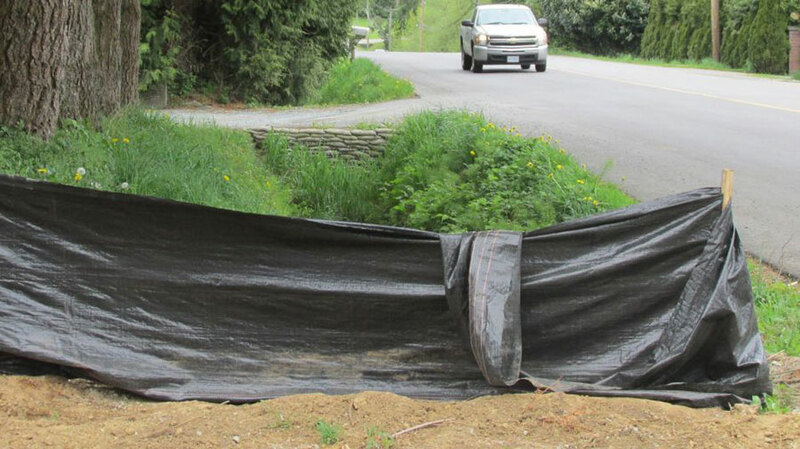 Silt Fence (Needed or Not) | All-Terrain Consulting Ltd.
Silt fence is the most commonly used Best Management Practice (BMP) for sediment control, and is the most incorrectly used BMP - even when it is installed correctly - which it ususally isn't. Silt fence is usually found along the outside permieter of site delineating the property boundaries, and is found on 99% of all erosion and sediment control (ESC) plans. Silt fence is also found in ditches, swales, and sediment ponds... the idea being to slow the water down within the swale or sediment pond allowing the sediment to drop out of suspension. While that may work for coarser sediment such as sand and larger silts; finer silts and clays will remain suspended regardless. Silt fence when used correctly for the right application can be magnificent. Silt fence should be installed so that the top of the fabric is approximately knee-height when banged in to a pre-dug trench and then the native soil back-filled against the fence (no need to import gravel or other material). The silt fence should also be taught with no hanging ends or areas along the fence. Silt fence can be used to impeed water from entering an unwanted area of site, impeed soil from sloughing into unwanted areas, and can also be installed on a diagonal to elevation contours to direct water to a desired location (i.e. installed with a slight angle to direct water off a section of hillside to a slope drain). Many times I will see silt fence drawn onto ESC plans arround the site only to arrive on site to see the site excavated 3 feet lower than where the silt fence has been installed. Pretty tough for water to flow uphill! I have also seen silt fence drawn on ESC plans where the native soil is sand. No need for silt fence there either unless steep slopes are present, as water will infiltrate quickly. Always know the soils on site before you make up your erosion and sediment control plans - otherwise you are likely going to be over-designing and installing materials that you may not need, costing the developer and contractor money they may be able to avoid spending. Silt fence is cheap, but you still need to pay for the labor to correctly install it - so make sure that when specifying silt fence on site, that you visit your site first, and install it where it will function properly.